A Garden is a living thing. You can never visit the same garden twice. 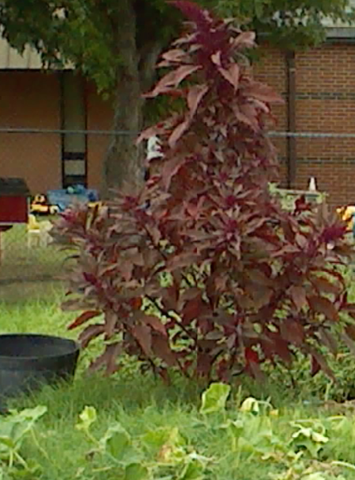 I visited the Garland Community Garden at 4022 Naaman School Road for two hours last week on Friday and then once again for two hours on Saturday and then again for two hours on Sunday. Gardens are like rivers: You never step into the same garden or the same river twice. They both continue to flow with or without human intervention. It's a great and reassuring experience to watch a living thing grow. Perhaps it's reassuring because the life and growth is a testimony to the continuity of life--sometimes even in spite of what we do or don't do. Take for example, the loofah and the morning glory vines. In late May or early June of this year I planted the loofah seeds in a pot in which I had planted morning glory seeds a few days before. The seeds for both plants took so long to germinate that I gave up on them. 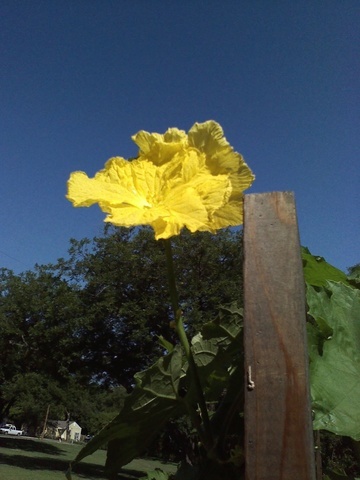 Then, the first week of July I noticed both the loofah and the morning glory seeds had sprouted. I don't know what caused the growth spurt, but somehow over the past three weeks the garden has gained a healthy loofah and morning glory vine. Then, just this morning (July 31) I was down there after the rain and the loofah vine is full of blooms as shown in the photo above. The morning glory isn't blooming yet (although the vine is healthy). The loofah vine is chocking it out. If I had only had more faith in my seeds, I would have planted the morning glory in another pot. Oh well. . . that's another thing about Gardening: there's always a second chance the next season. Now is the time to begin putting in your vegetables for your fall garden. Some members began on July 26. We currently have seeds with markers indicating where the seeds were sown so others don't over-plant. 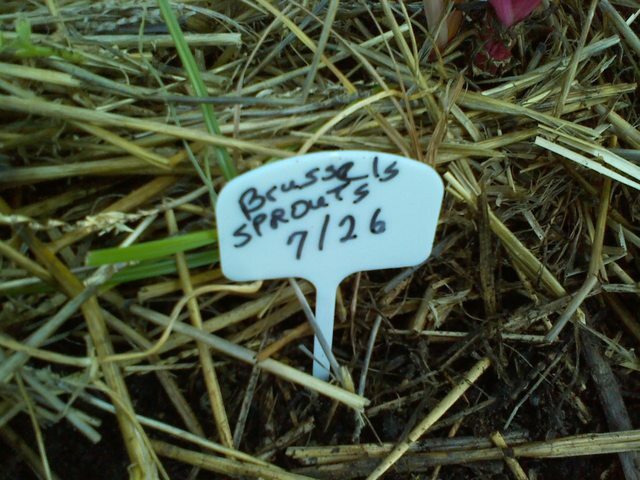 Thus far we have seeded Brussels Sprouts, Beets, and Kale. If you would like to plant a packet of seeds down there (4022 Naaman School Road, here is what you do: 1. Find a spot (ideally in the winding garden in the back) that has nothing growing in it. You may have to move the straw back. In fact it is advisable as then it is more visible where you have planted. 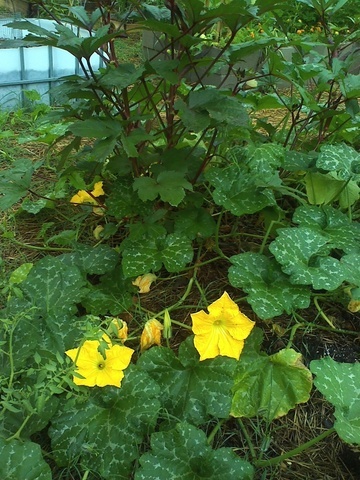 Please identify what you planted with a marker of some sort. Markers can be as simple as a wine cork stuck on a wooden skewer and the name of the plant written on the cork with a magic marker. If room, it's especially nice if you put the planting date. If you want more information on what to plant when in your fall garden in Garland, here is a PDF for you: Vegetable Planting Guide. Food diversity relates to food security. In general, the more food choices a community has, the higher its food security. The diversity of our food choices at the grocery store is largely an illusion. This point was sharply made in 2010 when a salmonella scare resulted in the recall of almost half a billion eggs. The recalled eggs were distributed across the country under the brand names Lucerne, Albertson, Mountain Dairy, Ralph’s, Boomsma’s, Sunshine, Hillandale, Trafficanda, Farm Fresh, Shoreland, Lund, Dutch Farms, Kemps, James Farms, Glenview and Pacific Coast--17 brand names all from the same large-scale producer: Wright County Egg, of Galt, Iowa. At the grocery store, we largely choose from brands of food--not from diverse food sources. Advocates of industrial farming often claim that without the factory model, not enough food would be produced to feed all of the people in the world. “Bigger is Better” is often quoted and that factory farming is the most efficient way to produce cheap food for the world. In fact this couldn’t be more untrue. Crop diversity spreads the risk. Large homogeneous crops, according to economist Martin Weitzman of Harvard University, enable parasites--bacteria, fungi, insects, and viruses-- to specialize on one specific host, thus increasing the chance they will mutate into a more pathogenic form. We think our current food system allows us a multitude of choices, but this is an illusion of diversity of choice. We really don't have a diversity of food to choose from. We have a diversity of corporate brands to choose from but not a diversity of food. "There are over 20,000 species of edible plants in the world yet fewer than 20 species now provide 90% of our food. Large areas of land devoted to single crops increase dependence upon intervention of chemicals and intensive control methods with the added threat of chemical resistant insects and new diseases. The changing world climate greatly affecting cultivation indicates a greater diversity is needed." Many believe that a greater diversity of food choice is ultimately critical to our survival as a species. Ten corporations control most of the food that Americans eat: Kraft, Pepsico, Coca-Cola, General Mills, Kellogs, Mars, Unilever, Johnson & Johnson, Proctor & Gamble and Nestle. The good news is that we can change this situation and introduce real diversity of food choices into our communities by growing some of the food we eat and by learning more about edible plants than can and do thrive in our locale. 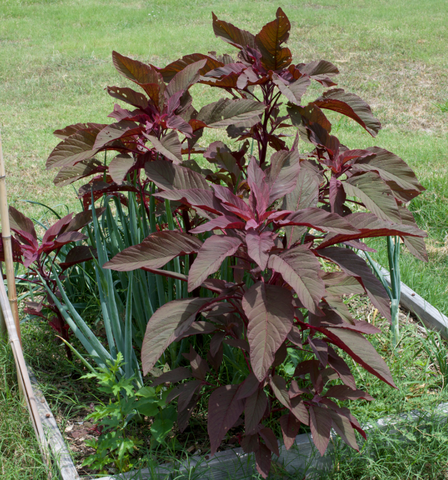 For example, I doubt that many folks in and around the DFW area have ever heard of "amaranth." I had not until about a week ago when I visited the neighborhood community garden, Fresh Connections, located here in Garland at 1212 Buckingham Road. During the visit I noted some very beautiful plants as you can see from the photos below (provided courtesy of Laser Printing, Inc.). I had no idea what they were, or even if they were edible, but I did know that I wanted some seed to plant some at the Garland Community Garden and one in my own personal garden. They are gorgeous plants. The photo shown below must have been taken earlier in the spring. Last week in mid July when I visited the garden, the plants were over five feet tall as shown in the photo above I took with my mobile phone. Turns out. . . Amaranth is an edible grain. Its small lovely red leaves are also edible. Amaranth has been cultivated as a grain for 8,000 years. It was a staple food of the Aztecs. These Indians also use the grain in their religious ceremonies--thus it's cultivation and use were banned by the conquistadors. However the grain continued to grow as a weed since that time. Much of the grain currently grown is sold in health food stores. In Mexico it is grown in limited quantities and is used at festival times in a candy called "alegria". Amaranth grain is also used to extract amaranth oil--a valuable seed oil that is used for many purposes. What is Amaranth good for? This fall Loving Garland Green will be working with the Garland Multicultural Commission to identify residents of Garland who are growing plants that most of us never heard of before. We hope to obtain plants, cuttings and seeds from these gardeners and create a garden plot at the Garland Community Garden that is filled with these unusual edibles that grow well in our climate. 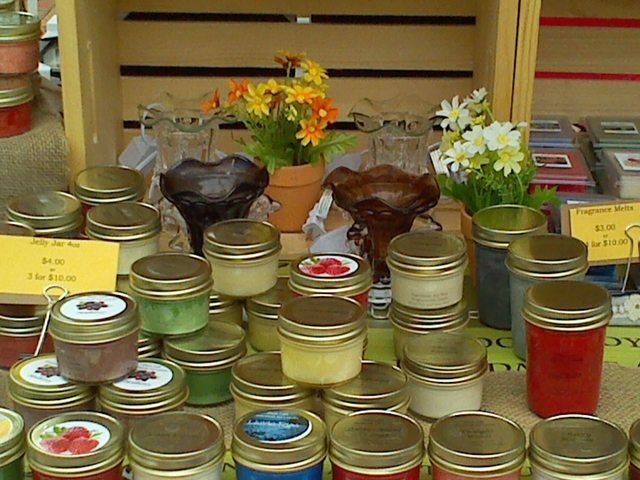 Today (July 19) was the third Saturday of the month and thus the monthly Garland Marketplace. It was the first time that Loving Garland Green had a booth there--actually, we shared a booth with Fresh Connections who have a community garden located at the Buckingham United Methodist Church on 1212 West Buckingham Rd. Garland. TX - 75044. If you missed the Marketplace today, you'll have a second chance on Saturday, August 16. We plan to have two booths. side by side on that date. I hope you'll be there. In addition to fresh produce, both Loving Garland Green and Fresh Connections brought live plants to sell. These plants were cuttings from our own gardens. 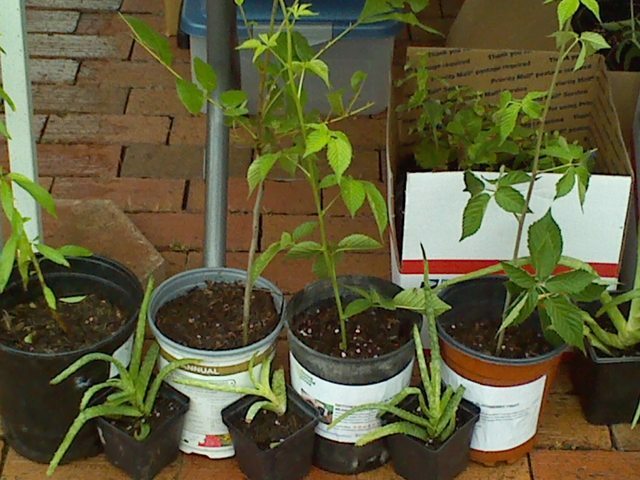 Below is a photo of 12 blackberry plants that I brought for Loving Garland Green. We sold out at $4 dollars a plant. Margie and Gene brought pecan and apricot trees; Marie and Jean brought a plethora of aloe plants; members of Fresh Connections brought numerous varieties of flowering plants for sale. Residents who are interested should mark their calendars for August 16, the date for the next Garland Marketplace as there is likely no place in the DFW area where you can purchase plants at such discounted prices. One of the ongoing goals of Loving Garland Green is to show our community, by example, just exactly how gardens can enrich the local economy by creating new markets and supporting existing markets. Today, solely through the sale of locally grown produce, cuttings from our garden, and an organic plant spray we made from cayenne pepper and water, we earned $97. As each new garden is installed in our community, our local economy will be enriched--not only in measurable dollar and cents value, but in other values as well that are not so easily measured. 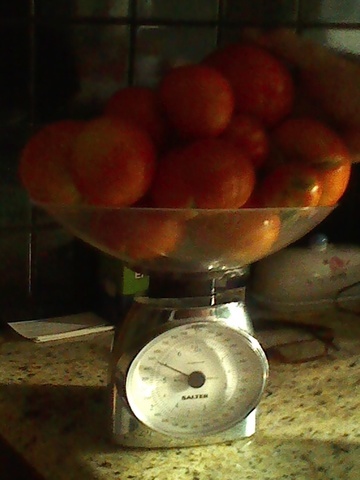 For example, how do you measure the value of the satisfaction you feel when you eat a tomato or a peach from your garden? How do you measure the value of feeling connected to the people in your community? How do you measure the value of improved health? Kirk Lovett, owner of Eventive Marketing Solutions, has worked hard for over a year now to attract vendors selling local produce at this marketplace. At last it looks like all Kirk's hard work is paying off. It's also nice to remember that a portion of the proceeds earned by the vendors at the Garland Marketplace go to support the Good Samaritans--a local nonprofit dedicated to giving a hand-up to the working poor in our community. I didn't count the vendors, but an eyeball survey tells me that at least 50% of the vendors were those selling edibles. And many vendors such as Melyssa Childs-Wiley, owner of Fat Lady Foods who makes delicious jams, purchase the goods they don't grow themselves from local folks. As for her commercial kitchen, Melyssa goes to the Hour Kitchen right here in Garland where she lives. That's how things work in a healthy local economy. Most of the money spent in a healthy local economy stays and is recirculated in that economy. That's the only bad thing for me about helping out in a booth at the marketplace--I don't have much time left to visit with all the other vendors, but I did make it around to a couple of the booths today. Naturally I had to stop by the Ragsdale Farms booth and chat with Paul Ragsdale and his son, Zach. They reported to me that today was their most successful sales event at the marketplace since they began participating last summer of 2013. I was so happy to hear that as I cannot think of any two people more deserving of success. Ragsdale Farms is located in Caddo Mills and they sell aquaponic produce, fresh farm eggs, mesquite wood and Moringa trees. Sounds like Zach is moving closer to commercial production of his Moringa Oleifera health products. The Moringa is tropical plant said to have over 46 antioxidants and 92 nutrients. It also contains 36 anti-inflammatory and over 20 amino acids. Moringa leaves also contain vitamins A, B1, B2, B3, B6, B7, C, D, E and K, Moringa has many medicinal uses and has been used to treat conditions such arthritis, rheumatism, anemia, cancer, diabetes, epilepsy and stomach complications such as spasms, ulcers, stomach pain and constipation. It is said that Moringa can also help to boost the immune system. Zach grows Moringa trees at the farm and he sells them at the Garland marketplace. I traded him a blackberry plant for a Moringa today. Stephanie also uses local sources for her supplies. Her food products are all pickle-based and quite interesting combinations. For example, she makes sweet and savory, "guilt-free" dessert pickles. featuring: Caramel English Toffee, Dutch Chocolate, French Vanilla Ice Cream, Banana Cream Pie, Cheesecake and Peach Cobbler. 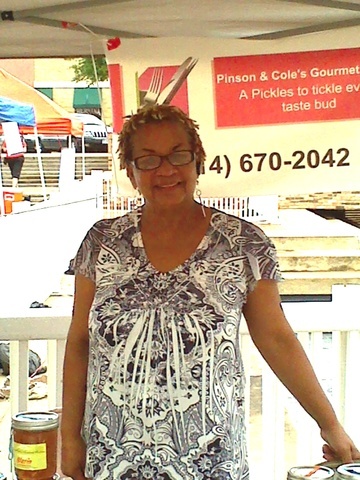 She makes beverage pickles such as Pina Colada and Hurricane Rum. She makes fruity pickles such as strawberry and grape. The sample I had was a chocolate pickled cucumber--same as last month. I know, it sounds awful, but guess what--as Stephanie says at her site, it was Pic-licious. Her pickles will add a new twist to any meal. To contact her directly, call her at 214-670-2042 or you can write to her at stephaniepcole@yahoo.com. She already has a restaurant in Irving that is serving her zesty marianades. Even more business will come her way as Stephanie is soon to be joined by her daughter from Colorado who is marketing professional. She has promised her mom to grow the business into a "real" company. Near as I can tell, Stephanie's company is already real--real good and pic-licious. All of the lovely scented soy candles you see in the photo above were made in the home of Delia and Randall Mora. In addition to these candles, they also create interesting pictures with dried flowers and leaves. 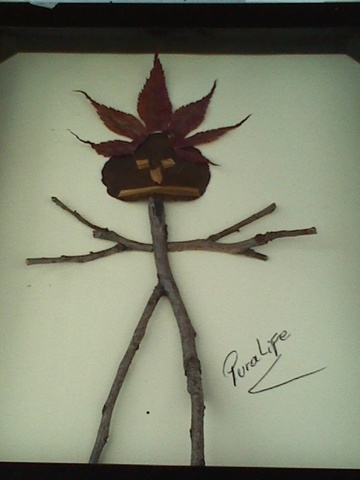 Below is my favorite one of a little creature. Visit their website at Pura Life. 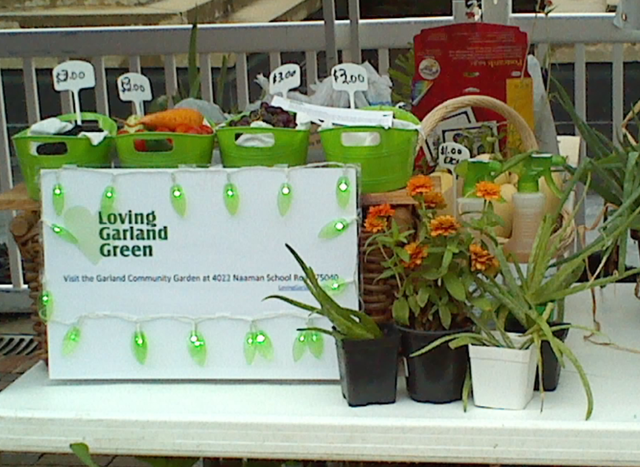 Lots of events and actions items are on the Loving Garland Green Calendar! Coming up fast is our first participation in the Garland Market Place this Saturday, July 19, from 9 to 2PM on the downtown square of Garland. Fresh Connections have generously agreed to share their booth with us. I've been busy getting things together that I will be selling. You can look forward to other items from other Loving Garland Green Members as well as from Fresh Connections. We will feature organic sprays concocted by members from items you can find right in your kitchen. The beauty of these insect repellents is that once they are gone, you don't have to spend extra money to purchase more. Instead you can just go to your kitchen pantry and mix up the replacement yourself, using the container the original contents came in. Four blackberry plants in my yard have supplied me with 15 pounds of juicy tasty blackberries and they are not finished yet. They began yielding fruit in mid May. 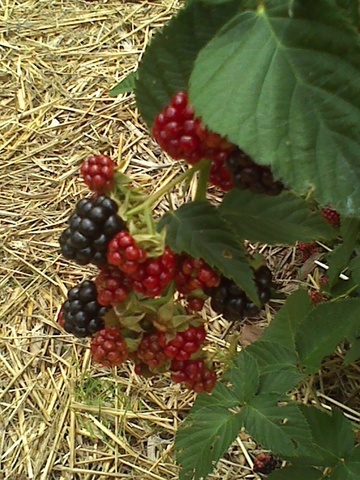 It you consider the average price for blackberries this season has been $4.98 per 12 ounces, those four bushes have thus far provided $99.60 worth of blackberries. If you consider they only take up 16 square feet of space and require only infrequent watering to grow. . . then if you consider their health value as antioxidants, blackberries are a plant worth considering for your North Texas garden. The second most productive plant in my North Texas garden this year has been two concord grape vines I planted last year. 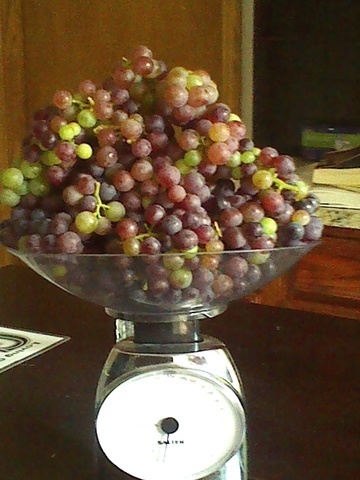 Thus far these two vines have product 18 pounds of grapes. At and an average of $3 a pound, the dollar value of these grapes is $54. However, the taste is priceless. If wine were made from these grapes, it would be a sweet wine such a Mogen David. Although Charlie is coming to an end of this batch of tomato plants for the spring/summer collection, he will still have a few pounds to sell on Saturday. Don't expect them to last so come early if you want any. LOVING GARLAND GREEN PROGRAM: "ANOTHER NEIGHBORHOOD COMMUNITY GARDEN"
Members from Loving Garland Green met (with Jim Griffin from The Good Samaritans, Mike Nunn and his son, Jonas, a Boy Scout from our community) to begin planning the installment of a neighborhood community garden to be located in the backyard of The Good Samaritans home on 12th street here in Garland. It was decided to have a Watermelon Kickoff meeting in mid-August for residents of the neighborhood to get them excited about participating in the installation of a fall garden at this site. Jonas and another Boy Scout will be assisting us in the design and build for this garden. Loving Garland Green will be assisting other neighborhoods in similar installations in Garland. We hope by spring of 2015 to have a network of at least four of these neighborhood gardens established. Gardens strengthen families, neighborhoods, and entire communities. Some folks don't realize this but filing with the state of Texas and obtaining state status as an nonprofit does not entitle a nonprofit to apply for most of the grant money that is available. The organization must be recognized by the IRS and registration with them costs $850--not to mention a rather horrendous amount of paper work. We look forward to the opportunity to seek funding from national foundations soon as some of our programs such as "Another Urban Garden" are at a standstill from lack of funding. We've already begun preparation of our demonstrations for this event. In 2007 Naomi Klein published a book titled "The Shock Doctrine: The Rise of Disaster Capitalism". The book makes a good case that libertarian free market policies (as advocated by the economist Milton Friedman) have risen to prominence in some developed countries because of a deliberate strategy by some political leaders. While citizens are too busy dealing with meeting basic survival needs during disasters to pay attention or mount resistance, these policies are passed into law and become entrenched in the society as "acceptable ways of life" in a democratic society. One such example includes the removal of usury laws. In the USA we once had laws that protected us from lenders who would charge more than the total value of the loan in interest rates. Those laws have long since disappeared in our society and debt is now one of the leading causes of poverty in the world today--particularly in the USA. Instead of looking at the fact that lenders are making the total value of the loan in profit and condemning this raw greed, we blame the borrower. We label them as "losers" who shouldn't have borrowed in the first place--after all this is a "free" country. Instead of charging wealthy people who can afford it higher interest rates, we think it fair to charge higher interest rates to poor people who can't afford these higher rates. Thus poor borrowers are more likely to default on their loans because of this extra burden. We are living in a world with upside down values and few are even aware of it. Instead, we accept it as the norm. Such disasters referenced in the shock doctrine include natural ones such as hurricanes and earthquakes and those created by the leaders themselves such as economic recessions and wars, and even those created by corporations who cut corners creating disasters such as the BP oil spill. In short, the disaster is the intial reason for leaders to act outside the bounds of the law and/or what is generally accepted as the decent way for human beings to behave. Then such behaviors over time become the rule, the accepted way of doing things and not the exception. One change that has occurred over time since the creation of our last and present recession that begin in 2008 is that work has been devalued. People now receive less pay for the same work they did prior to 2008. In fact, many people are even doing more work for less pay. Justifications for this behavior are made and new words creep into our language to justify it. In 2010, for example, we began to read about the "jobless economic recovery". When I first heard a pundit using the term "jobless recovery", I laughed in disbelief. This term was introduced to explain the rise of wealth in the USA at a time when so many people were and are still out of work. People belonging to the investor class (those with annual incomes exceeding $170,000 whose wealth comes primarily from their investments and not work they actually perform) are doing just fine. In 2010 I looked back at the increase in the net worth of our elected officials in Washington D.C. in the year from 2009 to 2010. At a time when many of their constituents were losing their jobs and homes, U.S. Senators and Representatives were increasing their net worth by hundreds of thousands of dollars. Some of them, such as Nancy Pelosi, increased their net worth by millions (far exceeding their annual $176,000 salary). Rep. Pelosi increased her net worth during that one year by almost $21,000,000. The wealthy class in the USA have never experienced the current recession that most Americans are still reeling from. I haven't thought of all the above for a couple of years now. It's too depressing and too frustrating because I understand fully how little control or power I have to change any of that. However my thoughts returned to that national scene this morning when a friend wrote to me requesting money to help the Detroit Water Brigade send water to residents in Detroit. The Detroit Water and Sewage Department is going door to door in Detroit, cutting off approximately 3000 customers per week who are delinquent on their water bills. As the Detroit Channel 4 news noted, it’s hard to understand why poor residents who owe a few hundred dollars should have their water turned while Detroit golf courses and stadiums that owe “big money” (per Channel 4) have no such threat. The people of Detroit are paying to help service the outrageous debt their city leaders incurred for them years ago by signing a rigged contract. So why is Detroit in the horrible place it is today? The answer is DEBT. Detroit must use the revenues from its three casinos: MGM Grand Detroit, Greektown Casino, and Motor Casino to cover a $4.2 million monthly payment to the banks before a single cent can go to schools, transportation and other critical services. A few years ago Detroit struck a derivatives deal with UBS and other banks that allowed it to save more than $2 million a year in interest on $800 million worth of bonds. But the fine print carried a potentially devastating condition. If the city’s credit rating dropped, the banks could ope out of the deal and demand a sizable breakup fee. That is precisely what happened in January of 2009. After years of fiscal trouble, Detroit saw its credit rating slashed to junk. Suddenly the sputtering Motor City was on the hook for a $400 million tab. So what does all of this have to do with us who live in the DFW area? There are some lessons that we can bring home from Detroit. 1. We can remember the value and importance of local politics and thereby start attending our council meetings where important decisions are made (twice a month in Garland) that directly affect our lives. We can also run for local office and volunteer to sit on city government commissions. It is most unlikely that we can influence politics at a national level or even at the state level; however, we can change things at a local level. 2. We can plant gardens in our homes, apartments. We can join groups like Loving Garland Green and the Greater Dallas Organic Garden Club. Gardens support the local economy by creating new markets and also by supporting existing markets. Today, Detroit is struggling to return to a plant-based economy. It remains to be seen if they will be successful in converting "Mo Town" to "Grow Town". Municipalities who begin the transition to a strong local plant-based economy while their local governments are still solvent have a better chance of success. Begin preparing for your fall garden today. April 11, 2014 Detroit won permission to pay UBS AG (UBSN) and Bank of America Corp. (BAC) about $85 million to cancel interest-rate swaps, a deal that may help the city speed the end of the biggest-ever U.S. municipal bankruptcy. U.S. Bankruptcy Judge Steven Rhodes approved Detroit’s third attempt at a settlement with UBS and Bank of America’s Merrill Lynch unit. The swaps have cost Detroit taxpayers about $200 million since 2009. Please remember that even if this ruling sticks that the people of the City of Detroit still must pay these lenders $85 million on top of the $200 million they have already paid. And how do you think all these payments to these lenders are being financed? They are being financed by cutting jobs and pensions to workers. Apparently anything goes to pay the banks and their investors. This is all the more ironic since the money was initially borrowed in the first place in 2005 to help meet the city's obligation to pay these pensions.